Home decor fabric will transform an old room into a modern chic one at half the cost of hiring an interior decorator. Decorating tips and tricks available through books, pattern company websites and privately-owned Internet sites can help you pick the right fabrics for any room. Interior decorating is not as difficult as you might think, and many online websites offer help. These sites provide all the tools necessary to see how your room will look once you have chosen window dressings, accessories and home decor fabric. Fabric swatches in patterns or colors can help you find just the right fabric to accent or compliment a new style. Interior design fabrics are available in a wide choice of textures, colors and patterns. Most interior decorating fabric is 50 to 75 inches wide and can be bought in bulk. Often upholstery and curtain fabric can be bought in the same pattern but in different weights. Plus, you’ll find that lighter weight accent fabrics for pillows and window shades are also available. Washable and dry-clean only fabrics allow you to pick the fabric you want. Many synthetic fabrics provide the look of natural fibers at a fraction of the weight and cost. Simplicity, Butterick, and McCall’s have entire lines of interior decorating patterns. These include widow shades, lined and unlined curtains, shower curtains, pillows, entire room groupings and books to help you create that special look. A wide range of interior decorating patterns for complete room transformations including the nursery, bathroom, kitchen, game rooms and more. Window dressing patterns including window shades, valances, panel and lined curtains. Upholstery patterns, slipcovers, footstool covers, wall hangings and organizers. 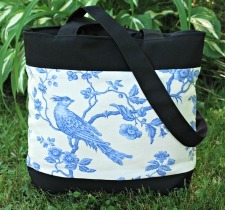 Try using some of your smaller fabric scrapes to sew up a great tote bag. Just about any print can be combined with a solid base as I have done here in this sturdy lined tote pattern. Fabric stores are one place to find home decor fabric and many retailers will allow you to take swatches with you. Some may charge a small fee for multiple fabric samples. Interior decorating shops may also provide fabric swatches and fabric. These retailers, while often more expensive, might offer a specific fabric not available in a fabric store. Online interior decorating fabrics offer a large selection of textures, patterns and weights however not all provide swatches. Without a swatch, matching colors becomes more difficult. The good news is some of the online fabric providers offer discounts that may not be readily available in retail stores. Interior design patterns include how much fabric you will need to complete the project as well as any notions, thread or fasteners needed. Using do-it-yourself interior decorating patterns means you may need to calculate the proper yardage amount before you buy the fabric. DIY patterns usually include directions on how to measure windows, furniture or doorways. Of course, there are guidelines available in books and online. Home decor fabric allows you to decorate a room in the style that you want for a fraction of the cost of ready-made items. Window dressings that accent a newly upholstered piece of furniture are easy when you buy interior decorating fabrics. Buying Fabric Online - Tips For A Successful Shopping Experience! Upholstery Sewing Machines - Do they fit your needs?